What is your favorite chain (not chain lube!!!) for your road bikes? I've been using Shimano 105 chains on my road and gravel bikes (both have the 5800 groupset), but am increasingly annoyed by the hollow pin and the inability to remove the chain for cleaning. I much prefer quick links, as I've used on low-end KMC chains on other bikes. I'm looking at non-Shimano options. You can get Shimano with quick links. New Shimano chains now include their quick link(at least the ones I've purchased did). I use the KMC chain. I like their removal link. I go through 3-4 chains per year. High mileage in wet conditions. Of all the chains I've tried I would rate Shimano as #1 for shift quality and simply being quiet. Campagnolo is right up there. In terms of mechanical integrity, the Shimano pin-system is superior to quick links. But, they must have been losing sales on these, as it required an extra minute per install. I know shops hated them because of this extra time, and that you had to read the provided instructions. I'd like a chain made entirely with quick links, then I wouldn't need a chain break tool. But until then, Shimano 11spd 105 w/ included quick link. While we're on the subject of chains, is 1500 miles out a chain reasonable? I got about 1500 miles out of the KMC chain that came stock on my bike, I've got about 1500 miles on the Shimano Ultegra chain I replaced it with and it just hit the .5 mark on my chain checker. I've heard people say that you can consider replacing the chain when it hits .5, and then definitely when it hits .75. But the Park Tool site says that for 11spd definitely replace at .5. Thoughts? FWIW, the KMC chain was quieter than the Ultegra chain on my Ultegra groupset. I'm putting a KMC chain back on, but went with the cheaper one with solid links, hoping maybe it'll be a little stronger and last a bit longer? I'm still using Shimano 10 speed groups so, I use the Ultegra 6701 with a KMC quick link. It last long, not too heavy, and priced right. All is well as for shifting, durability and maintenance of chain..
Just bought a Shimano 11 speed chain to replace the OEM chain. Haven't used anything else. So far, so good. 1500 miles would be disappointing in my book, but conditions will vary between riders. Yeah, I was thinking I'd get a lil more mileage out of them. Maybe that's just the price for riding hard and putting out a fair amount of power? At the rate I'm going, I'm looking at 5-6 chains a year. 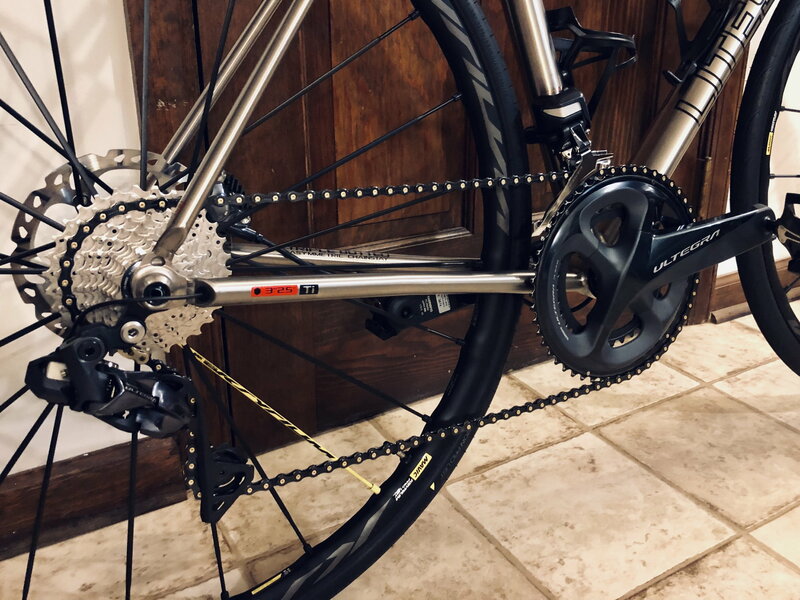 I make sure to wipe the chain down and lube after every ride, and I give it a full cleaning with degreaser in a chain cleaner usually once a week, or after a ride if it's wet out. Not sure what else I can do to make them last longer. Just to be curious how are you determining that the chains are worn out? I generally get 5 to 7 k miles before they need replacement on KMC 11speed chains. And generally 3 chains to a cassette. I use both a Park CC-2 Chain Checker for wear. I get 2,??? out of mine (Ultegra) and don't take care of it nearly so well. Clean it with a rag and lube every 100 miles or so. I have the Park CC-3.2 chain checker. My current chain just hit the .5 point. Am I shifting wrong, or doing something else that could be contributing to the chains stretching early? I do a lot of climbing, not sure if that contributes. The last two chains were SL models with cutout plates, getting ready to put on a KMC x11.93 with full plates. I don't care about a lil extra weight if it's stronger. KMC X11SL. Lighter, more durable, as strong, quieter and smoother than Shimano chains. What more could you want out of a chain? SRAM PC-1110. Fourteen bucks apiece, buy two at a time, rotate them. I put about 5,000 miles per bike a year, and the two-chain-rotation lasts a year. When the year is up, I throw 'em away. Twenty eight bucks a year seems fair. It appears some are not getting any return on their efforts. 1500 mi on a chain that is often cleaned thoroughly, is, imo, very much on the low end and feels like wasted effort cleaning it. My thoughts are you should look in your method of determining your chain is shut. It is well known most chain checkers add roller wear to elongation. Only very few checkers, like shimanos own, is designed to account for this - Tl-cn40 and tl-cn41. I would suggest such a device or a ruler or a caliper. I use the latter. Also I question the idea you should replace the chain a 0.5% if you are running 11s (but not 10s or 9s) Why? They are almost exactly the same. Of course this is not a chain lube debate, but your numbers suggest something is not right. If anyone care, im on 10s, I use a caliper to determine chain wear and lube the chain with a thick engine oil diluted with a bit of petrol and I never wash my chain any more. Its just wipe, lube, backpedal, wipe, done. Currrent chain is at ~2500 mi and is far from gone. Last edited by Racing Dan; 03-23-19 at 12:02 AM. I'm curious to know, how can you tell the cassette is worn out? I'm on my second chain for this cassette. I have chain checking too, so I know when the chain is done, but I'm unsure how to check the cassette. Thanks. Its not that easy, except if the chain skips. One method is to apply the brake, push the pedal down and observe the chain on the cassette. If it rides up the teeth as you increase chain tension its an indicator the cassette is worn. You will find the most used cogs are more prone to this than the least used ones. Thanks @Racing Dan. So far the new chain is working fine. No shifting issues, which I'm surprised by since the cassette only has had one chain on it thus far. Hands down Connex 11SX and Connex 11SB. Nothing else goes on my bikes. They can be removed using their proprietary quick link without tools as many times as you like without having to replace the quick link. It’s done by hand without tools which makes cleaning and maintaining quick and easy. They are also the best wearing chain I have ever had and shift flawlessly.